This recipe was inspired by a recipe that Giada DeLaurentiis made on her cooking show Everyday Italian. Ricotta in cookies may seem strange, but it makes the cookies oh-so moist and chewy. Giada made lemon ricotta cookies with a lemon glaze, but I thought it would be fun to modify the recipe for Halloween. 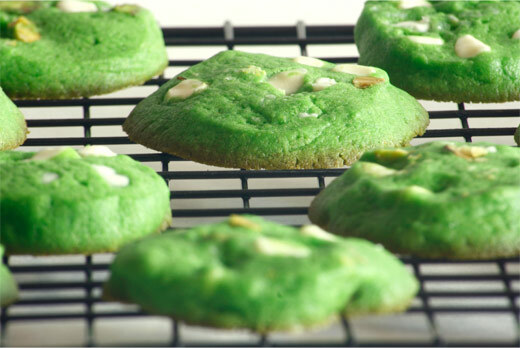 I added pandan to the batter to give the cookies a spooky green tint. After baking, I covered the cookies with a carrot glaze. The orange color really evokes Halloween. To finish the cookies, I sprinkled on some orange, green and black Halloween sprinkles. This Halloween, while the kids are over-loading on sugar from too many cloyingly sweet candy bars, the grown-ups can have something to enjoy, too. In a mixing bowl, beat the eggs with 1/3 cup of sugar for about 5 minutes. You'll get a pale yellow foam and the texture of the egg yolk will be thicker. Add the brown sugar and ricotta cheese. In a bowl, combine the flour, salt and baking powder. Sift all the dry ingredients. Cream the butter with the remaining sugar (whisk using a standmixer to get as much air as possible in the butter). Add the egg mixture and the dry ingredients. Add the pandan paste. 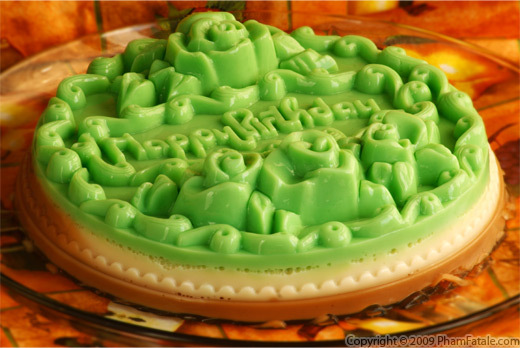 It will bring a distinct green color to the dough. Mix well. Place a silicon mat or a sheet of parchment paper on a baking sheet. Place the cookie dough about 2 tablespoons at a time onto the prepared baking sheet (or use a cookie scoop). Make sure to space the cookies about 2 inches apart so that they don't touch each other as they will expand when they bake. Bake the cookies for 20 minutes. Don't over bake them; you want them to be moist and chewy. Remove from the oven. Layer a cooling rack on top of a baking sheet (for easy clean-up of the carrot icing). Transfer the cookies onto the cooling rack. In a bowl, dissolve the carrot juice in powdered sugar. Add the ground ginger. Set aside. Drizzle each cookie with 3/4 teaspoon of carrot icing and top with the Halloween sprinkles. Let the carrot icing harden completely for about 2 hours. Make fresh ginger apple celery carrot juice with the remaining carrot juice. You can also freeze the tray for at least one hour, then transfer the cookie dough balls into bags that you vacuum-seal and place back in the freezer. I think it's the best way to keep the same flavor without getting freezer burn. I keep them exactly the same way I would do with extra pesto. You can store them up to 2 months in the freezer for last minute surprise guests. Published By: Jacqueline Pham on October 27, 2009. Jackie, great idea. I love how you've adapted that cookie recipe for Halloween! you're collection of pandan flavored sweets are impressive! these cookies look great! I love those cookies Jackie! They look perfect and what a great idea to incorporate ricotta into them.. I love that you used something organic to color the cookies instead of food coloring. You stay true to your style, and that's very commendable. Jackie - This is a cool idea. I've just gotten into pandan fruit because I've found it a lot in Australia. It's delicious. Love the idea of using it in a cookie. Love ricotta cookies. They look wonderful with your Halloween changes! Happy Halloween! What a cool Halloween cookie!! love these cookies they look so cute and with the addition of pandan, how wonderfully creative.